Use the chart below to determine your size. (1-6). 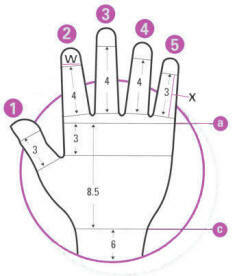 If your fingers do not all fit within the same size, you may need a custom glove. Talk to your therapist or doctor. Use the bottom chart to determine your size. (1-6).